Keri Mullen has been working with our glass for many years now. Her work has been featured internationally and was definitely the favorite of many audiences from shows past. She sent us a rich collection of recent work and took the time to give us the scoop. What’s new? What have you been up to? It’s been almost two years that I’ve been working with glass full time and it’s been a wonderful journey! Living in Asheville NC surrounded by so many amazing artists is such an inspiration to me. Your marbles are outstanding. Do you have any special connection to those? Thank you so much! 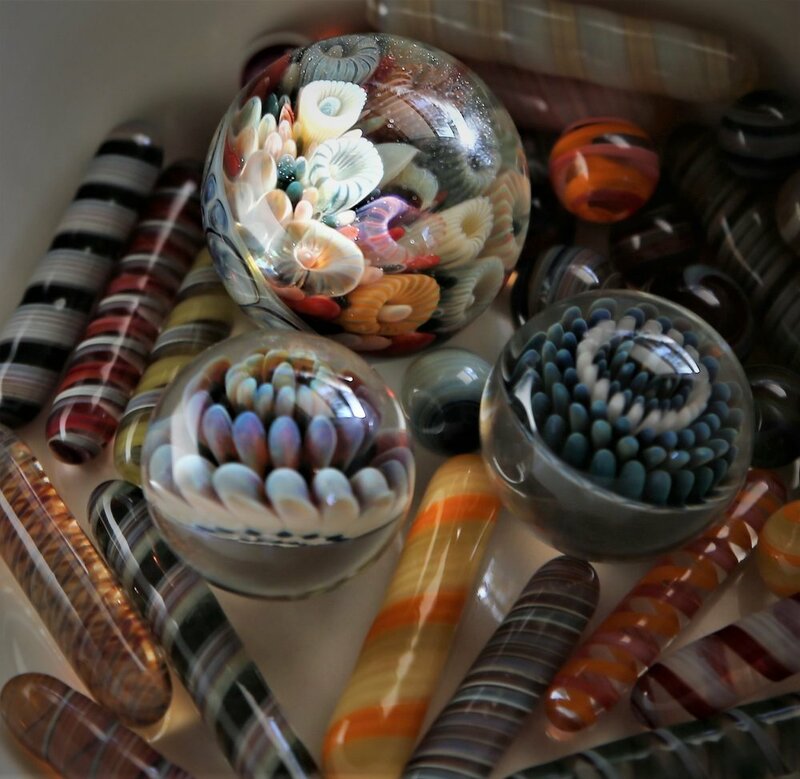 My grandma had a love for glass eggs and marbles, I remember helping my mom pick them out for her when I was a kid. A few years ago, I was invited to join the Facebook group Esfaras Perdidas (hidden spheres) which is a glass “hide & seek” group in San Antonio TX created by a group of the local glass artists there. Artists & members would hide marbles and post clues for others to seek them! Several other groups much like EP have been created in varies locations across the country and worldwide since then and have been spreading the love of glass thousands of members. It’s a great way to meet others in your community, spend time with family & learn about places around you. This sounds awesome. I will have to check out whether we have one of these here in Seattle. What can you tell us about the swirl candy cane? Cane is a basic term to describe the many variations of lattachino filigrano and zanfirico. With all the amazing colors available the color combinations are endless! I use it in a thick diameter for small marbles & teardrop pendants. I also pull the swirl candy cane thinner to use within my implosions. How should others use it? You should keep an eye out for some collaborations!!! Like I mentioned earlier there are so many local glass artists here! I’m looking to travel more this year to take classes and get back to teaching a few classes as well.